Storage After receipt, this product should be kept at -20oC for retention of full activity. Do not store below -20oC. Many published reports indicate that ISG15 (G1P2) is commonly upregulated in response to Type I interferon stimulation. Though a wide range of cellular activites are influenced by ISG15 expression including Type I interferon signaling, translation, chromatin remodeling, cell motility, protein trafficking, and protein conjugation (ISGylation), the complete spectrum of ISG15-dependent biological sequelae remains to be fully elucidated. Further definition of new ISG15 target proteins and the role of free ISG15 will offer new insights into mechanistic and immunotherapeutic approaches to human diseases. N Arnaud, S Dabo, D Akazawa, M Fukasawa, F Shinkai-Ouchi, J Hugon, T Wakita, and EF Meurs. "Hepatitis C Virus Reveals a Novel Early Control in Acute Immune Response," PLoS Pathog, 2011, 7(10): e1002289. C Dieterich and DA Relman. "Modulation of the Host Interferon Response and ISGylation Pathway by B. pertussis Filamentous Hemagglutinin," PLoS ONE, 2011, 6(11): e27535. YK Zhang, YL Wang, and JF Gui. "Identification and characterization of two homologues of interferon-stimulated gene ISG15 in crucian carp," Fish and Shellfish Immunology, 2007, 23(1): 52-61. T Takeuchi, T Kobayashi, S Tamura, and H Yokosawa. "Negative regulation of protein phosphatase 2Cβ by ISG15 conjugation," FEBS Letters, 2006, 580(18): 4521-4526. MP Malakhov, K II Kim, OA Malakhova, BS Jacobs, EC Borden, and D Zhang. "High-throughput Immunoblotting: Ubiquitin-like Protein ISG15 Modifies Key Regulators of Signal Transduction," JBC, 2003, 278, 16608-16613. J D'Cunha, S Ramanujam, RJ Wagner, PL Witt, E Knight, Jr. and EC Borden. "In vitro and in vivo secretion of human ISG15, an IFN-induced immunomodulatory cytokine," Journal of Immunology, 1996, 157:4100. J D'Cunha, E Knight, Jr., AL Hass, RL Trutt and EC Borden. "Immunoregulatory properties of ISG15, an interferon-induced cytokine," PNAS, 1996, 93:211. 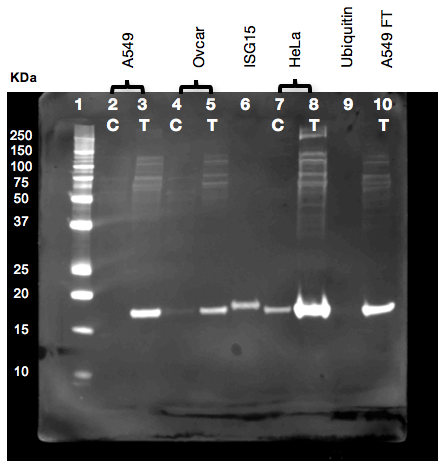 Control (C) and Treated (T) 40 μg lysate samples from A549, Ovcar and HeLa cells were run alongside 50 ng recombinant ISG15 and 100 μg ubiquitin on a 12% SDS-PAGE gel under reducing conditions. Cells were either untreated (C) or treated (T) with 1000 U/ml of Human IFN beta 1a (PBL Cat. No. 11410-2) and lysed with 50 mM Tris-HCl pH8, 200 mM NaCl, 10% Glycerol, 0.5% NP-40, 0.1 mM EDTA with protease inhibitors on ice for one hour and then centrifuged at 4°C to obtain supernatants. No cross-reactivity was observed with ubiquitin at tested concentrations up to 100 μg. The antibody was additionally tested on Daudi and U937 cell lysates (data not shown).